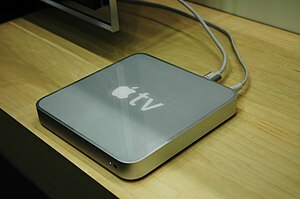 Apple TV, or iTV based on many rumours, was the big disappointment of the show for me. I suppose a lot of that was due to getting my hopes up by reading about all of the possibilities which ended up not coming true. Namely the addition of an app store. The second being that lack of an app store, but I’ll get to that later. One thing that did come true was the $99 price tag. I knew Apple weren’t going to go with the exchange rate and make it around £60 or £70, but I expected something around £80 as a fair price. That didn’t happen, and they just went ahead and announced it for £99, which really is just wrong and a joke in my opinion. Yes, I can understand that it’s a different economy, with different taxes. Still, to charge the same amount, when one currency is worth close to double the other is just ridiculous. Despite the fact that it is ridiculous that they charged as if we share the same currency, £100 isn’t actually that bad all things considered. It’s soured in several ways though. The first being that it doesn’t come bundled with an HDMI cable. Surely that’s what 99% of people will be using to connect this to their TVs. Why not inclue one? As far as the device itself, it’s a redesigned and cheaper Apple TV. It uses an A4 Chip just like the other iDevices do now, which lends credibility to rumours that this could be updated to run apps. It’s capable of outputting up to 720p but no 1080p, which is disappointing but not necessarily a huge loss as most content available isn’t available in full HD and I don’t see that changing soon. In the end, Apple decided to strive for two main objectives with this new Apple TV. It had to be affordable and easier to use than previous versions. Maybe an App Store will come and they just wanted to keep things simple for the time being to give the market a chance to absorb the basics rather than overloading them and rushing into too much. With that said, the iPod Touch seems to be doing just fine in sales and that has an App Store and can be fairly complex at times to understand, so that argument may not hold up well. The actual features of this new Apple TV remain very similar to the previous one, except now there is no hard drive and the emphasis is on streaming and the rental model, which personally I much prefer as long as the prices are fair. The internet based content offerings remain similar with the usual youtube and podcast watching. You can also now stream Netflix instant watch movies if you have an account with them. This is a nice touch, especially as they’re competing with Apple in rentals. Obviously, if they had done a LOVEFiLM app for the UK then I’d be a lot more interested, especially if it did 720p streaming, But that didn’t happen. Hopefully more movie streaming options will be forthcoming. Apple have also redesigned the remote for Apple TV. It’s now longer and looks more like a traditional remote, but is still very different at the same time. It still has very few buttons and no keypad. This isn’t a huge loss though since you can use your iPhone or iPod Touch to input text which should make searching for things much faster. It’s also made of aluminium now which is an interesting choice and will definitely make it more likely to stand out among all the standard bland remotes we all have on our coffee tables. Overall, I think the new Apple TV is a step in the right direction, while not being particularly world changing. It’s a safe update by Apple in much the same way as the iPod Shuffle was this year. The lower price and new streaming rental model should ignite sales for the time being. The product line has huge potential and I’m sure apps will be coming at some point, whether in this particular model through updates, or in future ones. Definitely watch out for big things in this space in the next couple of years with the likes of Google TV coming soon to provide some hopefully stiff competition. In the meantime at least, it’s definitely lacking something special to get me excited about it enough to want one, but I hope that changes sometime soon.